We just finished all voting on the last MPI-2.2 tickets! This means that MPI-2.2 is fixed now, no changes are possible. The remaining work is simply to merge the accepted tickets into the final draft that will be voted on next time in Helsinki. I just finished editing my parts of the standard draft. Everything (substantial) that I proposed made it in with a reasonable quorum. The new graph topology interface was nicely accepted this time (I think I explained it better and I presented an optimized implementation). However, other tickets didn’t go that smooth. The process seems very interesting from a social perspective (the way we vote has a substantial impact on the results etc.). Add a local Reduction Function - this enables the user to use MPI reduction operations locally (without communication). This is very useful for library implementors (e.g., implementing new collective routines on top of MPI) – PASSED! Regular (non-vector) version of MPI_Reduce_scatter - this addresses a kind of missing functionality. The current Reduce_scatter should be Reduce_scatterv … but it isn’t. Anyway, if you ever asked yourself why the heck should I use Reduce_scatter then think about parallel matrix multiplication! An example is attached to the ticket. – PASSED! Add MPI_IN_PLACE option to Alltoall – nobody knows why this is not in MPI-2. I suppose that it seemed complicated to implement (an optimized implementation is indeed NP hard), but we have a simple (non-optimal, linear time) algorithm to do it. It’s attached to the ticket . – PASSED! Fix Scalability Issues in Graph Topology Interface – this is in my opinion the most interesting/important addition in MPI-2.2. The graph topology interface in MPI-2.1 is horribly broken in that every process needs to provide the *full* graph to the library (which even in sparse graphs leads to $\Omega(P)$ memory *per node*). I think we have an elegant fix that enables fully distributed specification of the graph as well as each node specifies its neighbors. This will be even more interesting in MPI-3, when we start to use the topology as communication context. – PASSED! Extending MPI_COMM_CREATE to create several disjoint sub-communicators from an intracommunicator -Neat feature that allows you to create multiple communicators with a single call! – PASSED! Add MPI_IN_PLACE option to Exscan – again, don’t know why this is missing in MPI-2.0. The rationale that is given is not convincing. PASSED! Define a new MPI_Count Datatype – MPI-2.1 can’t send more than 2^31 (=2 Mio) objects on 32-bit systems right now – we should fix that! However, we had to move this to MPI-3 due to several issues that came up during the implementation (most likely ABI issues) POSTPONED! It feels really good to have this strict implementation requirement! We will certainly have this important fix in MPI-3! Add const Keyword to the C bindings – most discussed feature I guess – I am not sure about the consequences yet, but it seems nice to me (so far). – POSTPONED! We moved this to MPI-3 because some part of the Forum wasn’t sure about the consequences. I am personally also going back and forth, the issue with strided datatypes seems really worrysome. is not valid! Two threads are also not allowed to concurrently send the same buffer. This proposal will allow such access. - PASSED! Something odd happened to New Predefined Datatypes. We found a small typo in the ticket (MPI_C_BOOL should be 1 instead of 4 bytes). However, it wasn’t small enough that we could just change it (the process doesn’t allow significant changes after the first vote). It was now voted in with this bug (I abstained after the heavy discussion though) and it’s also too late to file a new ticket to fix this bug. However, we will have an errata item that will clarify this. It might sound strange, but I’m very happy that we stick to our principles and don’t change anything without proper reviews (these reviews between the meetings where vendors could get user-feedback have influences tickets quite a lot in the past). But still PASSED! For all tickets and votes, see MPI Forum votes! I’m very satisfied with the way the Forum works (Bill Gropp is doing a great job with MPI-2.2), I hear about other standardization bodies and have to say that our rules seem very sophisticated. I think MPI-2.2 will be a nice new standard which is not only a bugfix but offers new opportunities to library developers and users (see the tickets above). We are also planning to have a book again (perhaps with an editorial comment addressing the issue in ticket 18 (MPI_C_BOOL)! The Computer Science Department at Indiana University is no more. I was told that it was one of the oldest CS departments in the US. 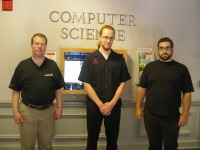 Now, the webpage says “The Computer Science Department is now School of Informatics and Computing” which is not correct. It’s actually only division in the school formerly known as “School of Informatics”. The department seems to have turned into the “Computer Science Program”. Some people ask me what the difference is to the “Informatics Program” — I honestly don’t know.